This tutorial provides heightmaps, links to them, and talks about what to look for. It is written from the point of view of someone wanting to use them for modelling terrain in Blender, but it is relevant to modelling with other 3d packages. Koordinates and Landcare Research are two sources for heightmaps. They have maps of all of New Zealand in GeoTIFF and ASCII formats, which can be opened with QGIS. These websites know heightmaps as Data Elevation Models (DEMs). You can download several at once, you can also crop an area of interest which saves on download time. Both websites allow you to choose the map projection. Just accept the default. The heightmap in Tutorial: Make mountains in Blender from height maps was created by the University of Otago - National School of Surveying who have published it at Koordinates, and is released under a Creative Commons Attribution-Share Alike 3.0 license. This allows commercial use, with acknowledgement. They supply these as a series of tiles which you can join together in QGIS. They also have maps showing roads, property boundaries, aerial photos, and more that can be used as textures. This website is similar to Koordinates. It has fewer DEMs. But does have a complete 25m DEM of each of NZ's two main islands. Some of the licenses are Creative Commons, others are a little more restrictive. 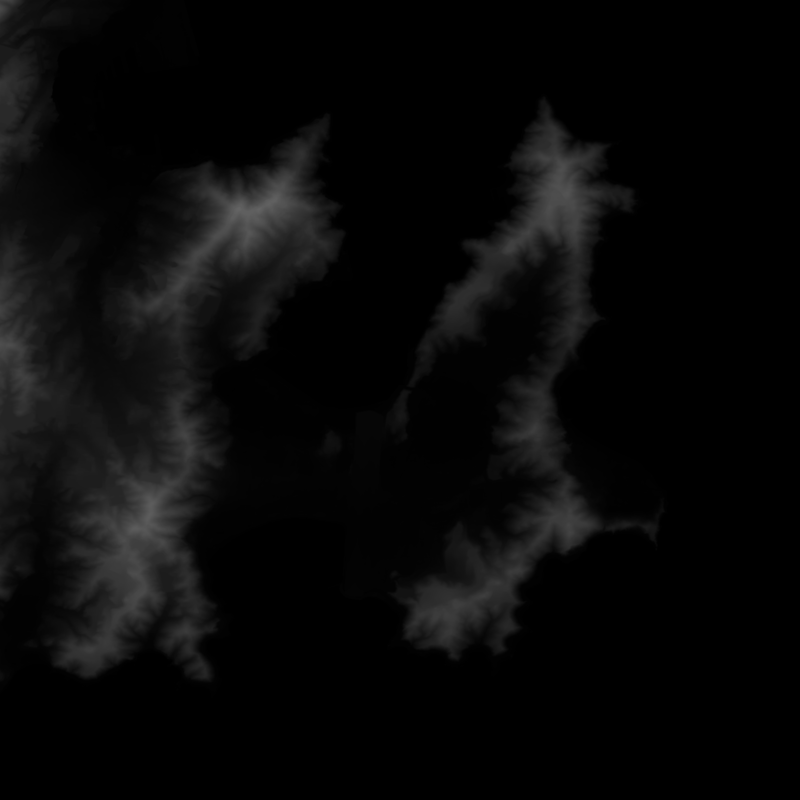 And here's a, high resolution, 1m DEM of Wellington East, try subdividing it 600 times. There are details in it that you won't see in the height maps above. You can see the cutting where the road goes through the hills into the Miramar peninsula, the plateau formed by the airport, the wharves, the roads around the coast. Jonathan de Ferranti has spent a lot of time improving DEMs from NASA's Shuttle Radar Topography Mission (SRTM) and other sources. He has his improved DEMs available from Viewfinder Panoramas. These are in .hgt format which can be opened with QGIS. All heightmaps files are an array of numbers. The numbers are often stored in an image format as a grayscale. The metadata makes it easy to join maps together. This is important because the maps are often broken up into tiles. New Zealand, which is a small island country, has a 25 metre DEM that is 1.7 gigabytes in size. A 1 metre DEM of Wellington, NZ's capital, is .6 gigabytes in size, imagine how big the file of a continental country would be!. QGIS is your friend for these special file formats. It is free. In the next tutorial, Export Heightmaps from QGIS by Screenshot, I will show you how to use it to convert DEMs into a usable format.